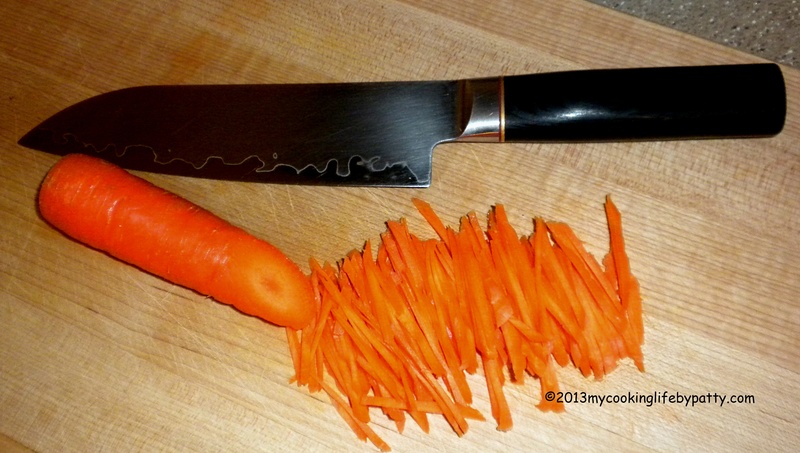 One of the things I enjoy about cooking is using my excellent knives and slicing my vegetables and other ingredients myself. I am not one to rely on food processors, mandolins or other gadgets much. It’s a beautiful thing to skillfully slice cucumbers and have them come out evenly thin or to master paper-thin onion slices or to perfectly shred a head of cabbage. And when I’m through, I only have to wash my knife! Another thing I like about hand-slicing vegetables is that I can control how they cook better by how I cut them. If I want the vegetables to finish cooking at the same rate and in the same amount of time, then they must be about the same size. But what if the carrot is thick at the top and skinny at the bottom? If you cut this carrot in horizontal slices you are going to wind up with big slices and tiny slices. When you cook them, the big ones may be underdone and the little ones overdone. But if you cut them in slices at an angle, you can adjust your angle so you end up with pieces that are about the same thickness and size and they will cook pretty much at the same rate and in the same amount of time. This makes for more perfect and more aesthetic-looking dishes. Notice how the matchsticks are all about the same length? This is because the carrots was sliced at an angle making them even throughout. The angle was adjusted as the carrot got bigger toward the top. Sometimes you just have to look at what you’re cooking and think about how you will be cooking it and what you want it to look like; you just figure out how to prep the food to get what you’re going for. Today I picked up some baby bok choy. It was fresh and lovely and I wanted to lightly steam it with sliced mushrooms. I didn’t want to cut the beautiful leaves up very much but I knew I had to do something to get the thicker stem ends to cook in the same amount of time the more delicate leaves would cook. I decided to separate the stems from the leaves and make the stem pieces small enough to steam with the leaves. This is what I came up with. 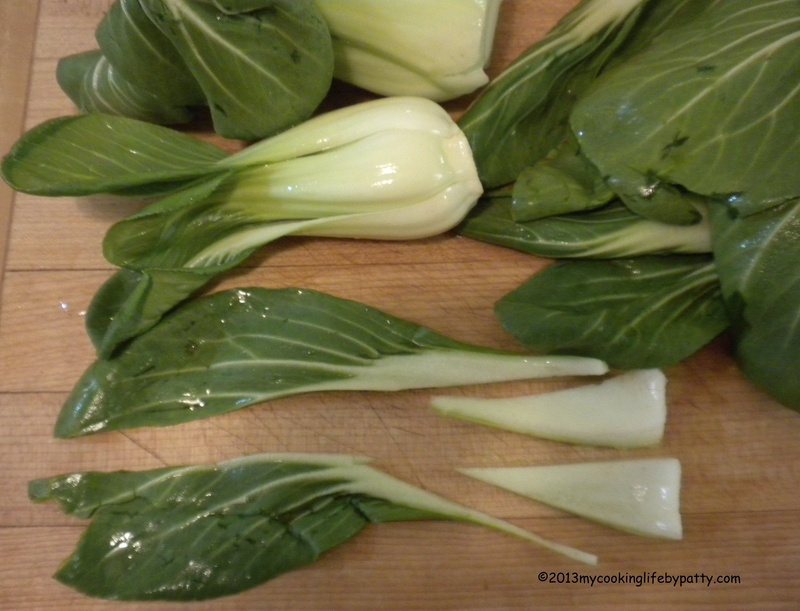 This way of slicing my baby bok choy worked out very well! The bigger stem pieces were cut into more than two pieces. The way to learn how to slice vegetables so they are attractive and will cook consistently is practice, practice, practice! This entry was posted in Basic Cooking Skills, Cooking and tagged bok choy, carrots, julienne, slicing technique, Vegetable knife, vegetables by mycookinglifebypatty. Bookmark the permalink. Good knife skills are what I aspire to and I enjoyed reading your techniques but I’m entirely too clumsy and may very well lose a finger or two if I tried to emulate your mad skills. Glad you enjoyed it. The sharper the knife, the safer it is, actually. Wow Kathy! I bet you can do some pretty tricky stuff with that paring knife. Is it really sharp? I actually love a good paring knife and I use it too.